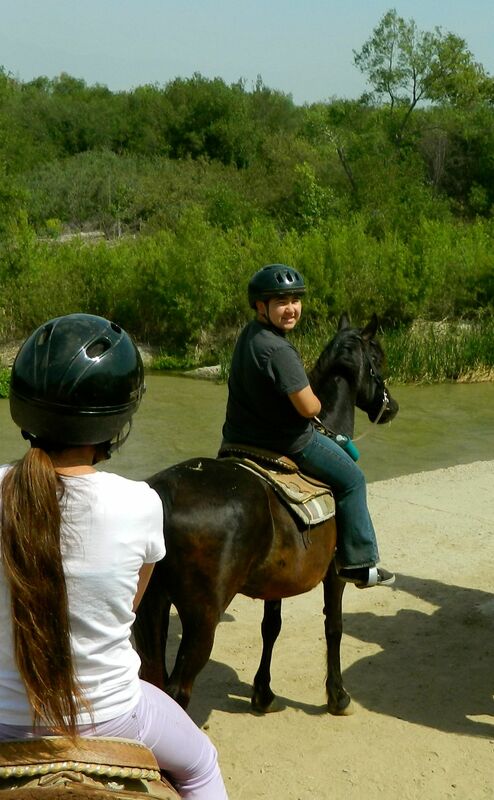 One of the best ways to see the Santa Ana River up close is on the back of a horse. 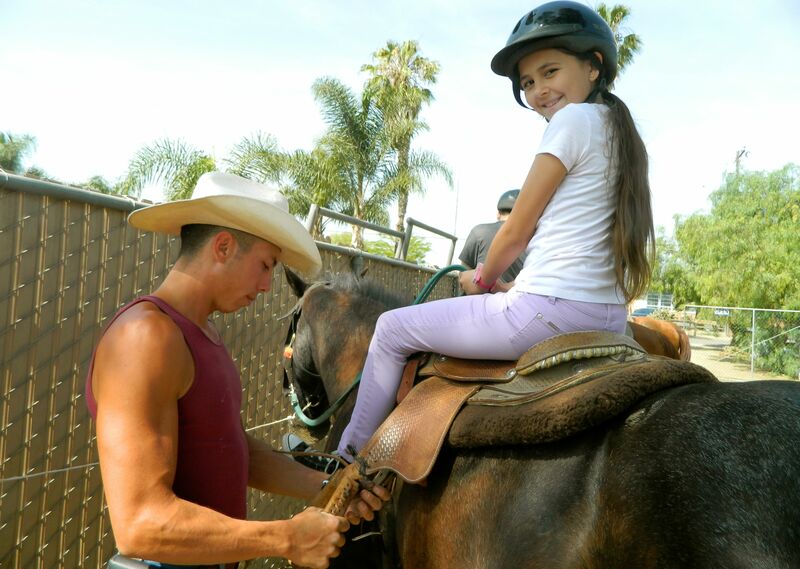 The Santa Ana is the spine of a watershed that reaches from Big Bear to Huntington Beach, and you can show your kids one of the best up-close views of its natural beauty while riding the horse trails in Norco. Our tour follows along the Santa Ana River in Norco. Saddle Up – No Need for Nerves! If your kids are a little afraid of horses, don’t fear. Emily was excited but increasingly nervous as it came time to saddle up – especially when she saw just how big the horses were. Alex, the trail guide, was great with her – as soon as she was up, he took her around the paddock and showed her how to get her horse to go, stop, and turn left and right. Alex, our trail guide, helped Emily get over a case of jitters. It turns out her horse, Fedencio, didn’t need a whole lot of direction. The “kid horses” as they call them, are extremely docile and follow their leader without much question. Some of the adult horses require a firmer hand, which makes for a more interesting ride. Ten minutes into the trip, Emily declared that riding horses is “the best thing ever!” This introduction to the world of horses may become expensive for her parents. Hunter reaches the river’s edge. Despite being the second largest river in our area, many people don’t know much about the Santa Ana or have had a chance to really see it up close. When driving by on the 15 Freeway, you are more likely to see the trees that grow up around it than the water itself. The Santa Ana is a seasonal river that has a large basin to handle occasional floods. However, it still provides water for more than four million people living in the Inland Empire and Orange County. The first clear view you get of its sparkling water is during the approach from Corona Ave. A wide sweep of shallow water is banked by cottonwoods, mustard plants, and bamboo forests. As our horses moved down into the basin, we crossed large deposits of soft sand created by the river’s winding journey from mountain to ocean. The sand itself could have once been rock in the San Bernardino Mountains, carried all the way to Norco by the snow-fed river. We ride through the shady woods along the banks of the Santa Ana River. California is known for our microclimates, and it’s easy to see them when you move from the hot flats above to a cool and shady world growing up around the river banks. While bamboo is not native, it is fed by the river water and offers relief from the sun. Your kids can learn how cottonwoods get their name when the white puffs of seeds float around them. You can also explain that the yellow flowered plants they see are a legacy from Father Serra’s walk to establish the California missions. As he moved north, he threw mustard seeds on the ground to help other settlers follow the trail. The ride lasts about an hour, which is just enough time for first-time riders and fidgety children. 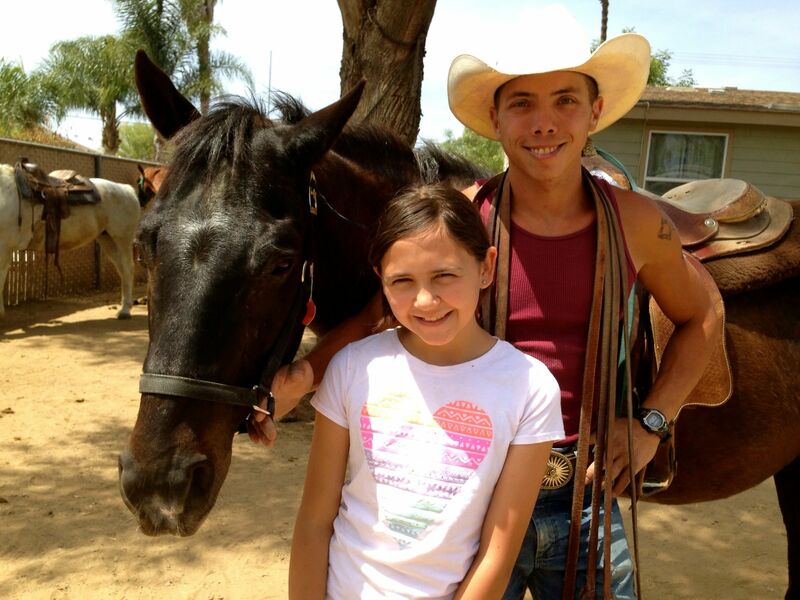 At the end of the ride, you can take a picture with your horse! 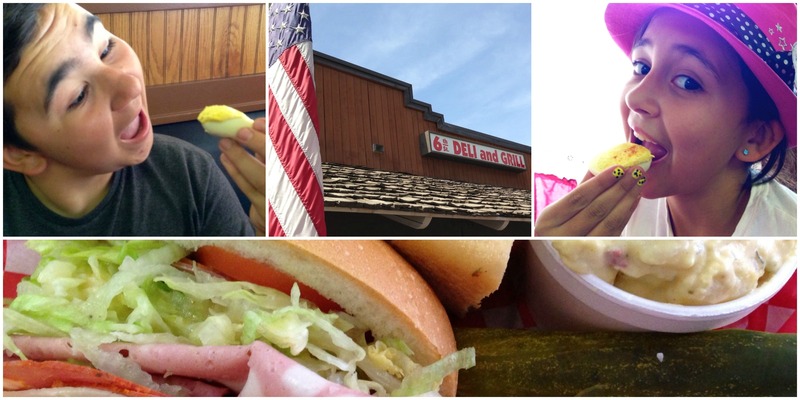 One of the most popular lunch eateries we found was the 6th Street Deli, located in Old Town Norco. Belly up to the counter and choose from an extensive list of sandwiches, deli salads, and grill items. The deviled eggs are not to be missed at $2 for a plate of four. They were so popular I ended up ordering another half plate. Splurge on the deviled eggs – they were extremely popular! The atmosphere of the 6th Street Deli gives you a window into life at Norco. It’s a bit of a trip back in time – they have a friendly staff, red check tablecloths, a lot of warmth, and zero pretentions. A community announcement wall is lined with posters for riding lessons, grooming services, and horse vets. It can provide great entertainment for kids while they wait for their food – but they might be too tired to do more than sit and sip a cold drink!